It comes down to the Green Bay Packers (10-6) at the Chicago Bears (11-5) for the NFC Championship. The Packers beat the Falcons on the road in a one-sided game 48-21 to continue their run. The Bears also had a pretty easy time beating the Seahawks at home 35-24. The Packers and Bears met twice during the regular season, with both teams winning close games at home. When Chicago played Green Bay at home on September 27th, two field goals (one assisted by a Green Bay fumble) late in the game sealed the win for Chicago 20-17. When the game went to Green Bay on January 2nd, a 46 yard pass by Aaron Rodgers to Greg Jennings resulted in the game winning TD early in the 4th quarter. Neither team would score after that, and the game ended 10-3 in favor of Green Bay. That final win by the Packers over the Bears was just enough to secure them a spot in the playoffs. The win against the Atlanta Falcons advanced the Packers into the NFC Championship game. This was the fourth win in a row for Green Bay. Aaron Rodgers and the Packers offense were unstoppable the entire game, other than a fumble by Greg Jennings on their first possession. The Packers did not punt once, and scored 35 consecutive points. 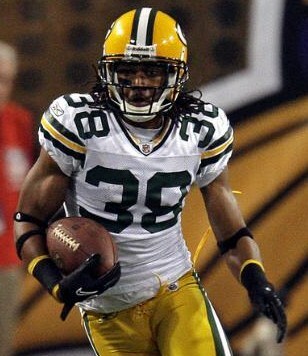 The Falcons had no answer to stop the passing attack of the Packers, as Rodgers went 31-36 for 366 yards and 3 TD’s. 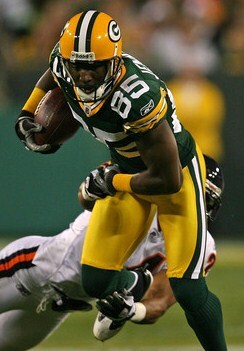 Greg Jennings led the way as he has done all season, with 8 receptions for 101 yards. The Packers ran 31 times for 96 yards, which was just productive enough to keep the Falcons guessing. To make matters worse, the Falcons turned the ball over four times, including a 70 yard interception for a TD by Tramon Williams to end the first half (He also made the interception off of Michael Vick to seal the win against Philadelphia). Charles Woodson (5 tackles, 1 sack) and Clay Matthews (2 sacks) held Matt Ryan and the Falcons to 186 passing yards, and 45 yards on the ground (39 by Michael Turner). If it wasn’t for the 102 yard kickoff return by Eric Weems, the longest in NFL playoff history, the final score would have been even worse. Green Bay had four scoring drives of 80 yards or more to control the clock, as they held the ball 16:38 longer than Atlanta. The Packers won the battle between their passing game, and the running game of Atlanta. As my last post suggested, “If a team scores more than 24 points, they should have the advantage”. The advantage went to Green Bay 48-21. The Chicago Bears game was never in doubt. They beat Seattle at home to advance to the NFC Championship game. The Bears scored the first 28 points of the game. Jay Cutler was only 15-28, but had five passes for over 20 yards, two long TD’s (58, 39 yds), and played well enough not to lose the game. Greg Olsen had three receptions for 113 yards on the Bears first three scoring possessions, including the 58 yard TD which came on the third play from scrimmage. The Bears rushed 45 times for 176 yards with Matt Forte, the work-horse all season, rushing 25 times for 80 yards. Cutler added 43 yards and two rushing TD’s. Brian Urlacher (7 tackles) didn’t have to do much run stuffing because Seattle got down early and only rushed 12 times for 34 yards. Seattle was 3-14 on third down conversions, and couldn’t execute in the snow against the Bears tough defense. A 62 yard punt return and an interception on the Bears next possession gave the Seahawks a quick 10 points after being held to 0 in the first 40:48 of the game. It was too little, too late. A key factor noted in my previous post was the Bears winning between the trenches, which allowed them to possess the ball 14:21 longer than Seattle. The Seattle defense could just not hold the Bears under 21 points, and lost the game 35-24. The Chicago Bears and Green Bay Packers have a bitter rivalry that is accentuated because they are both in the NFC North. They have played each other 181 times, more than any other teams in the NFL, with the Bears leading the series 92-83-6. Interesting enough, they have not met in the playoffs since 1941. I was speaking with a Bears fan just the other day that said the Bears could go 1-15 and consider their season a success as long as they beat the Packers. I am sure that sentiment is felt the same way with the Packer fans as well. Both teams are coming into this game on very positive notes. Green Bay is breaking playoff records. Scoring 48 points last week was the most playoff points scored in their franchise history. Aaron Rodgers’ 10 TD passes in his first 3 playoff games is the most ever, and he is also the first quarterback to have a passer rating over 120.0 in each of his first 3 playoff games. To say the least, he is on fire, and the passing game is setting up the running game. 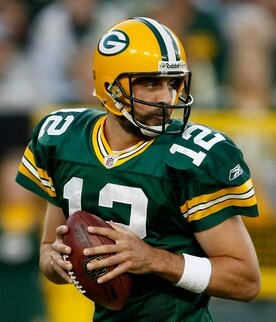 The question is, can Aaron Rodgers stay this hot, or will the fire burn out? The Packer defense has also been solid, allowing 126 total rushing yards in two playoff games, producing eight sacks, and creating 5 turnovers. The Packers seem to be running on all pistons, and they just need to continue to do what they have been doing in order to win another playoff game on the road. The Bears will need to pound their running game, which will set up the pass and control the clock to keep Aaron Rodgers off the field. 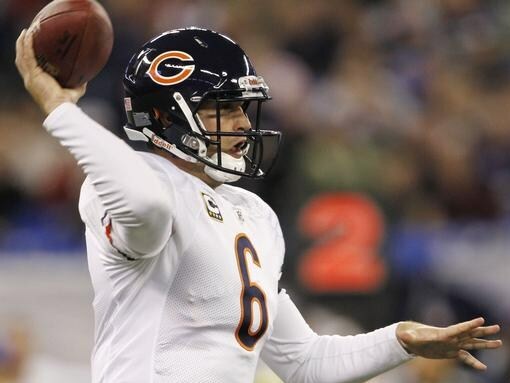 Again, Jay Cutler doesn’t have to win the game on his own, but just needs to play another mistake-free game. Turnovers in this game could be critical. The Bears defense needs to mix things up with different schemes and blitz packages to pressure Aaron Rodgers and keep him guessing. The Bears will have to continue preventing the Packers from making any big plays against them. The more third down situations they can get Green Bay into, the better chances the Bears can pull off a victory. Both teams have held their opponents to an average of under 20 points per game. In their previous two games against each other, neither team scored more than 20 points. With that said, I believe the team that wins and moves on to the Superbowl will be the team that scores at least 28 points, weather permitting. ~ by Troy Erickson Realtor on January 19, 2011.